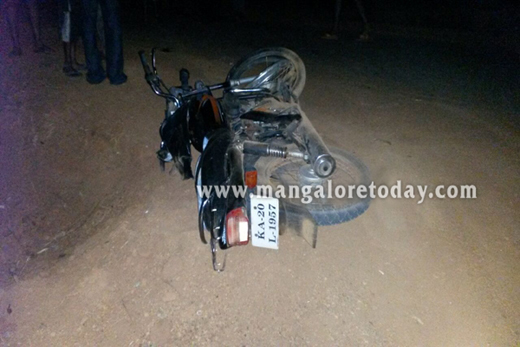 Kundapur, Mar 04, 2015: A bike rider was killed and another sustained injuries in two separate mishaps reported from the taluk on March 3, Tuesday. In the first mishap, which was a hit and run case, one Mahesh Acharya (30) of Kundarabandadi lost his life when his vehicle was hit by a pick-up truck on the Mullikatte-Alur road near Haklady. The deceased Mahesh was a carpenter by profession. In another mishap reported from Adikekodlu village near Vandse, a bike rider named Ganesh Devadiga (30) sustained critical injuries when his bike was hit by a tipper on the Kollur road. It has been gathered that the tipper was over speeding. Even the pillion rider whose identity is not known, suffered injuries. Both are undergoing treatment in the local hospital.